What is HDMI? – HDMI stands for High-Definition Multimedia Interface and it is a digital audio & video standard that is capable of handling uncompressed digital data. HDMI can transmit both digital video and Dolby Digital and DTS digital audio in a single cable. This type of connection was made to be used primarily with televisions not computers. For connecting a single TV to a computer, you can use an adapter to convert from DisplayPort or DVI, to HDMI. Ideally, you should always try to connect directly (no adapters) when possible, but a TV can be connected using adapters. If your TV supports it you can use the new DisplayPort connection, for extremely high resolutions and throughput. However, if you have a multiple screen computer such as a QuadStation system, HDMI is not the best choice for connecting monitors. The best way to connect is to use video cards and monitors with the same type of ports. This allows a direct, straight through connection from DisplayPort (on the video card) to DisplayPort (on your monitors) for example. Again HDMI is really for connecting a television, DisplayPort and DVI are best for computer monitors. Multi display video cards that support more than one HDMI port are not common if they exist at all. That said, to use multiple HDMI you would need to use adapters and or cables to convert the signal from the video card. The best way to connect monitors to a video card is always direct using DisplayPort or DVI. This is not to say that you cannot connect multiple TVs to your computer by using DisplayPort or DVI to HDMI adapters. This would be required only if your monitors or televisions do NOT have DVI ports. Most of them do however if you only have HDMI ports, you will have no choice but to use adapters. For example, note the DVI to HDMI adapter shown left. The DVI side of the adapter would be male which connects directly to your video card on the computer. 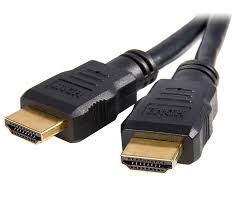 The HDMI side would be female which would allow you to use a standard HDMI cable to connect out to your televisions. 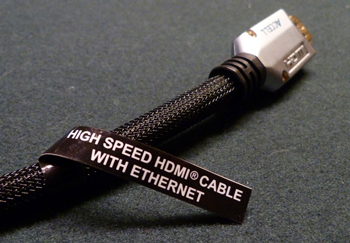 Separate HDMI cables long enough to reach your TVs would need to be purchased in addition to the adapters. The maximum resolution you will obtain when connecting a TV to a computer is totally dependent upon the TV port that is is connected to. Typically HDTV’s will support 1920×1080 regardless of which port you are connecting to even though your video card may support a higher resolution. All TVs are different so depending on the quality of your TV you may not get 1920 x 1080. Again, the limitation here is the television itself, NOT the video cards usually. Check with your TV manufacturer for full TV specifications. Ask them specifically about the resolution capabilities of the port you would like to connect to NOT the TV capabilities. That is completely different. The extra ports on televisions are considered “auxiliary port”. Remember, a TV is designed first and foremost to be just that, a TV not to connect to a computer. So the TV manufacturers in our view, do not put so much emphasis on these auxiliary ports. In fact you may find it difficult to find the resolution capabilities of a DVI or VGA (typically called PC INPUT on the TV) port in your TV manual resulting in a call to the manufacturer. DVI stands for Digital Visual Interface and displays very high quality video on digital display devices such as digital LCD/LED monitors and digital projectors. Like HDMI, DVI can also carry uncompressed digital video data (better quality) from the source to the display (video card to monitor). In fact, the video quality is exactly the same as HDMI depending the cables being used. The primary difference is that HDMI carries audio in addition to video, DVI is video only. However, if you plan on using extremely high resolutions (greater than 1080p) on your TV, new High Speed HDMI Cables (shown here) and Display Port can support resolutions of 3840×2160 and 4096×2160 with DisplayPort v 1.2+. Up to 8k coming soon with new HDMI v2.1 standard. Read more here. Max resolution 1920 x 1080 up to 10ft. 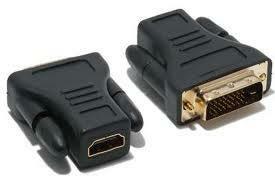 – DP-HDMI cables are not allowed by HDMI LLC and they have moved to have import of DP-HDMI blocked. DP-HDMI adapters however, are allowed. Then HDMI-HDMI cables would connect to the adapter. There are ‘passive’ and ‘active’ DP-HDMI adapters in the market today that support “HDMI 1.4” which can drive UHD 30fps. Cable length restrictions are the same as for any HDMI-HDMI connection. ​DVI can also support resolutions greater than 1080p, but with a maximum of 2560×1600. So if you compare a DVI cable to an HDMI cable on a television that supported 1080 max, the video would be identical. If your TV supports higher than 1080 res, the HDMI would show a sharper due to the higher resolution, but ONLY if your TV supports higher than 1080p. To utilize 4K resolution (3820 or 4096) of course you will need a TV that supports resolution that high and they are not cheap. Most TVs as of 2014 are firmly standardized on 1920 x 1080 HD resolution, however 4k TVs are surfacing quickly as of this writing. HDMI v2.1 The HDMI 2.1 spec supports 8K resolutions at 60Hz, and 4K resolutions up to 120Hz thanks to a new 48Gbps Ultra HDMI cable. The cable is backwards compatible with earlier versions of the HDMI specification and can be used with existing HDMI devices. For more details read here. Note that HDMI v2.1 was announced in Nov 2017. As of mid 2018 there is no DisplayPort to HDMI v2.1 adapter that support 5k. Also, to get 5K resolution using DisplayPort, it will always require TWO DisplayPorts on the video card for EACH 5k (or higher) display. More on DisplayPort. In summary, if you are using a multi display computer system always connect DisplayPort if you have that option. This means you will need DP monitors and cables. Your second choice would be using DVI. If you are using TVs as your monitors, determine what types of connections your TVs support. If they have DVI ports, use DVI cables all the way. If the TVs have only HDMI ports, you will need DVI to HDMI adapters as well as HDMI cables long enough to reach your TVs. If you have questions about anything in this article, please feel free to contact us, we will be happy to discuss it with you. Call us today. All of our multiple screen QuadStation computer systems come with DisplayPort and or DVI connections.